Before and after severe weather events, after fires and earthquakes, municipal agencies face challenges in preparing their community, and to identify and evaluate hazard impacts before and after these events. During El Nino years, large and small scale landslides are not uncommon on natural and man-made slopes. As a result of the fires of 2017 and 2018, a large portion of the hillsides above communities in Santa Barbara, Ventura and Los Angeles County were charred, and ensuing debris flows occurred. 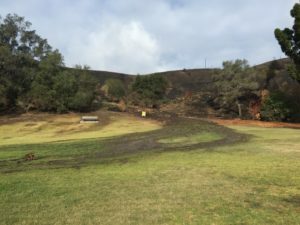 Denuded of vegetation, these slopes now have a layer of surface soil altered by the fire that increases the likelihood of severe erosion and debris flows even during normal rainfall years.